For this kind of sailing you need a lot of presence of head, heart and will. 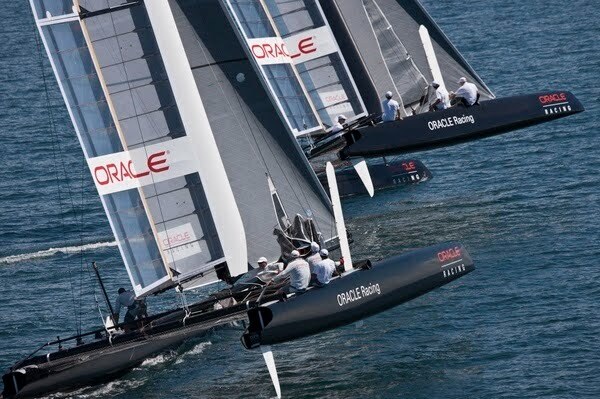 After many years of fights in court, it seems that the Americas Cup has found the way to go forward. 45 feet (approximately 15 meters) catamarans. For sure it looks spectacular. Lat year I sailed with a client in his catamaran, a Tornado, and it was great. It’s much smaller than these in the video but the speed is incredible. In the past we -monohull sailers- looked with dedain at catamarans. Those were the beach boys, fooling around and you couldn’t take them seriously. It was not the real thing. It was only about speed and the tactics were not important. After years of sailing I’ve come to the conclusion that in my boat it’s about speed as well. Tactics kick in as soon as you’re fast enough. These catamarans just go faster and it is more fun to sail them. Already during the past two falls I’ve been looking at a second hand catamaran. I even put my Star (still the most competitive boat in the world (-:) for sale last year. Will I buy a cat this year and hit the water in Noordwijk?